1.) I am thankful for doctors who will squeeze you in last minute. Miss. E's doctor got her in when I called with my concerns. She was so kind about it and reassured me. I am appreciative of my access to health care and the medications that Miss. E needs. 2.) Miss. E is doing better. She is no longer fevered, her breathing sounds (mostly) normal, she is more alert and she is eating again. Those few days were scary, so I am happy to see my little girl acting more like herself. 3.) I worked one day this week. I was supposed to work two, but I took the one off to stay home with Miss. E. The work day went well and it was nice to use some of my skills again. 4.) My parents came over to help me this week and I so appreciated it. They vacuumed my house (my vacuum is broken so they brought their Dyson), watered flowers and bought me lunch. Yay for parents! I am very lucky. 5.) I have read three books in the past few weeks and it reminds me that I need to keep up with my reading! I have always been a major bookworm, but with my new(ish) role of Mom, I don't always get to read. I really enjoyed the last book I read. It was Married 'til Monday by Denise Hunter. She is one of my favourite authors. I also read Irene Hannon's book Buried Secrets. It was great! 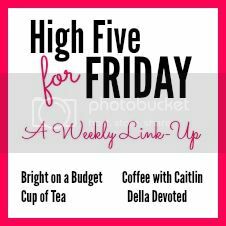 If you want to join in or if you want to read some more "High Five For Friday" posts check out the link up below! Have a great weekend! Hi Ashley, I'm visiting from H54F. I'm glad your baby girl is feeling better, it is no fun when they are sick. My son's pediatrician is great when I have concerns too. It is reassuring to Mommy! Yay for more time to read. That is something I am always trying to squeeze in too! Thank you for visiting, Emily! It is definitely nice to have that reassurance, especially when it comes to kids! Reading is one of those things that seems to fall by the wayside when we are busy. It is important to make time for those things. ;). Easier said than done some days! Ha ha! I love doctors who make time for their patients too! My old family doctor never seemed to be able to fit us in. We recently moved to a new doctor and she's about a million times better. It makes such a difference! Thanks for stopping by! Wonderful, compassionate doctors are so wonderful. It makes you feel more comfortable as a mom! So glad your little one is bouncing back! Your sweet parents - it's so nice when people come over to lend a hand, or vacuum. Hope you had a nice weekend - and hope E is back to her normal self! Thank you so much, Katie! We are slowly getting there!